Below we are reproducing an article from the American journal of Worker Medical Advisory Board, Health and Hygeine published in 1935. In this article the author gives a succinct account of how the socialist health care worked in the Soviet Union during time of Stalin. ALONG with every tremendous stride it has taken in developing industrial and agricultural progress, the Soviet Union has taken the necessary steps to safeguard and improve Soviet workers’ health. Rest homes, sanitariums, “keep the-baby healthy” stations and hospitals grew up alongside great factories and on giant collective farms. ~’hen plans were made to build a city, as at Magnitogorsk, these plans included first and foremost abundant provision for taking care of the health of the workers. American engineers have reported, on their return from the Soviet Union, their surprise at the manner in which new plants were set up. Before the foundations of the factory or mill were laid, homes for the workers who were to build the factory were erected. The Americans pointed out that in the United States the factory is the first consideration. Workers can always be housed in the rudest sort of shacks. In the Soviet Union, where prevention of ill health is of paramount importance, the homes are built first. The successful completion of the first Five Year Plan in four years and the carrying out of the Second Five Year Plan at as great a speed, requires great physical and mental effort for the Soviet workers. 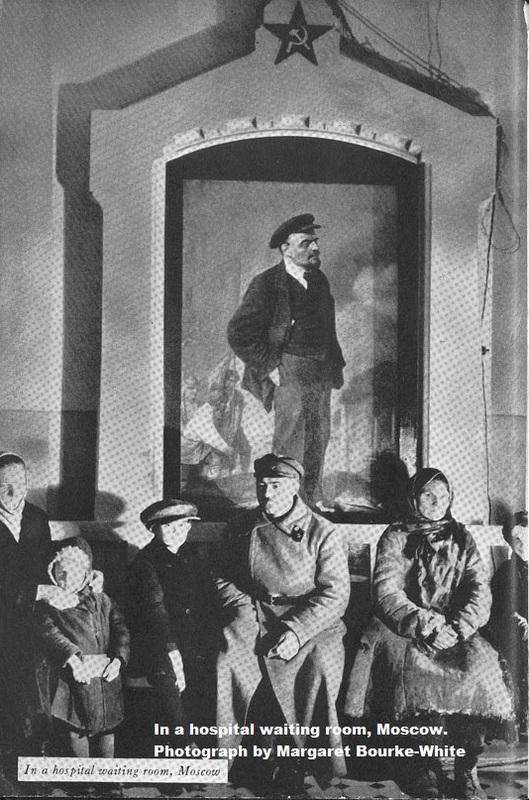 The physical welfare of the shock brigaders, the heroes of labor who set the pace for the other workers, is the greatest concern of the Soviet government. Every precaution is taken to maintain and ensure the good health of the workers. The keyword in health matters in the Soviet Union is prevention. In the United States and other capitalist countries, we do not go to a doctor or clinic until we are sick. In the Soviet Union, where health is cared for on presentation of a union card, not on presentation of a fee, the workers are trained and urged to go to the clinics at the slightest sign of something wrong or likely to go wrong. A worker who has fever will be sent by the factory doctor to the clinic. This worker, assured that he does not lose his job and knowing that he will be paid while away, soon learns to prevent ill health. In the United States, the worker who goes to a clinic is oppressed by the feeling of “charity.” 12 The clinics are meant only for those who cannot pay for private treatment and this is felt by every worker. In addition, these clinics, especially in the smaller towns, are overcrowded. It is sufficient here to give some figures on the clinics of the Soviet Union. This does not cover other working conditions, conditions in the home, rest homes, etc. In 1932, the All-Union Public Health Conference adopted a plan to cover the entire Union with a network of clinics. This plan is part of the second Five Year Plan and is to be completed by 1937. Now, in 1935, much has already been accomplished. The plan is based on the principle that three types of clinics are needed to cover the general and specific needs of each industrial centre. The clinics are set up and staffed according to the population. These clinics are: the Polyclinic, which handles general work. This includes aD . x-ray department and a clinical laboratory where examinations of blood, sputum, urine, etc., are made. There are also two special type clinics which take care of the patients referred by the Polyclinic. Here the special branches of medicine are covered. These three types of clinics, the Polyclinic and the two special clinics, are combined in one unit. The number of units and the number of doctors, nurses and attendants is determined by the size of the city or town. For towns larger than 60,000, clinics are established in the ratio of one unit for each 50,000. Thus, in Moscow, Unit No. 1 serves 46,000 people, Unit No.2 serves 55,000. The fifth unit is equipped to handle an even greater number. It serves 65,000. On the other hand, in Colomna and Podolak, cities with less than 60,000 population, there is one unit to each city. 1750 visits daily or more than 500,000 visits per year. The staff of each unit consists of doctors, nurses, technicians and clerical help. The number of doctors in each speciality has been carefully worked out according to the requirements. The largest units, with 50 doctors, cover every speciality. Where the smaller units, in the APRIL, 1935 .. villages or small towns, do not cover a speciality, the standard unit is called upon. These units are clinics and are not to be confused with prophylactic stations, maternity clinics, baby health stations, rest homes, sanitoria, hospitals for acute and chronic diseuea and other institutions under the All Union Department of Public Health. From the above will be seen the fundamental difference between public health in the Soviet Union and in the United States. In the Soviet Union all health is public health. Workers do not go to a clinic as a last resort, after being unable to pay a private doctor. They go to the clinic as a matter of course, as part of the public health policy of the Soviet Union for the prevention of sickness.